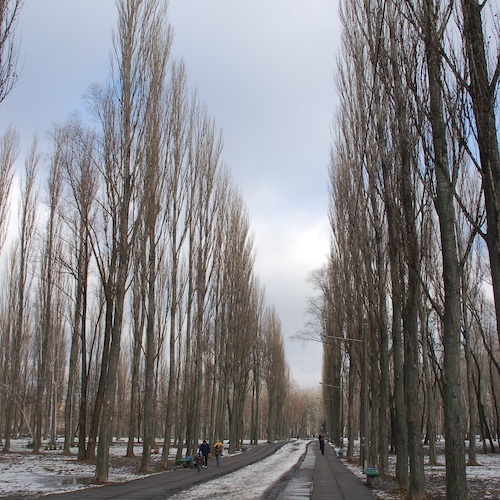 Introduction: What Is Babi Yar? What is Babi Yar and what happened there? Babi Yar was part of a vast, complex ravine on the northwestern edge of Kiev (Ukraine). It means ‘Old Woman’s Ravine’ or ‘Grandmother’s Ravine.’ In 1941, Babi Yar was the site of the largest single German massacre of Jews in the occupied Soviet Territories. As an execution site, the Nazis and their collaborators used an area of the ravine that had steep slopes, nine spurs, and extended for 1.5 miles. At various places it was from 30 to 160 feet deep. On the narrow bottom ran a stream. On September 26, 1941, an announcement was posted in the streets ordering all Jews in Kiev to assemble by 8:00 a.m. on September 29, 1941. They were to bring with them their identification documents, money, valuables, and warm clothes. On the morning of September 29, the assembled Jews were marched to the Jewish cemetery that bordered the edge of Babi Yar. At the Jewish cemetery, fences had been put up and the area was guarded by three rings of soldiers and police. In groups, the Jews were ordered to undress and leave behind their identification documents, belongings, and valuables. They were then led into the ravine through previously existing paths and some newly-made paths; the Nazis and their collaborators then walked them to various execution sites, extending for about one mile throughout the ravine complex. The Jews were either shot while lying down or while standing on a narrow ledge. This depended on the execution site. At dark, the Nazis and their collaborators stopped performing new executions and instead walked over the bodies shooting anyone who was remaining alive. The slaughter went on for two days. According to the Germans’ own records, 33,771 Jews were shot and killed in only two days, September 29 and 30. Many other people were executed at Babi Yar over the two years the Nazis occupied Kiev, including more Jews, Soviet prisoners-of-war, gypsies, and political prisoners. The murders in the ravine continued until the very last moment when the Nazis began fleeing the oncoming Soviet army. It is unknown how many people were ultimately murdered at Babi Yar during the Nazi occupation—some believe it might have been as many as 100,000. The Nazis used prisoners of war to cover up the initial mass graves in the ravine. Two years later, in September/October 1943, as the Russian Army drew near Kiev, the Nazis rushed to dig up the bodies and burn them. They used slave labor from the nearby Syrets labor camp. For six weeks, this Sonderkommando dug up the bodies, burned them on cremation grates, and reburied or scattered the ashes. Surmising correctly that the Nazis would eliminate them when their work was complete, the men from the Sonderkommando revolted and escaped. Of the 14 men who survived the escape, eight told their stories after the war. Alley in Babi Yar, Kiev. By Roland Geider (Ogre) (own work) [Public domain], via Wikimedia Commons. On March 13, 1961, a dam holding back waste from nearby factories burst. A wall of water swept down the Babi Yar ravine, obliterating everything in its path and killing several thousand people in the neighborhood around the ravine. This disaster greatly changed the topography of the ravine and washed away much of the physical evidence of mass murder. Later construction transformed Babi Yar. Today, the site can no longer be recognized because it was leveled out for the construction of a park, apartments, roads, and bridges. The fact that the NKVD set the bombs was testified to by Alfred Jodl, Chief of the Operations Staff of the High Command of the Armed Forces, at the International Military Tribunal in Nuremberg. At first the Germans thought it was sabotage on the part of the local population but later they found a demolition chart, which had been prepared a long time before, listing 50 or 60 buildings that were to be destroyed. Jodl himself saw the chart and used it to defuse the remaining 40 bombs before they could be detonated. http://holocaustresearchproject.org/einsatz/babiyar.html. For a full account of the events surrounding the destruction of Kiev and the subsequent round up and execution of the Jews see Karel C. Berkhoff, “Babi Yar: Site of Mass Murder, Ravine of Oblivion,” p. 2. Karel C. Berkhoff, “Babi Yar: Site of Mass Murder, Ravine of Oblivion,” pp. 5, 6. Operational Situation Report USSR No.101, October 2, 1941 and Occupational Situation Report USSR No. 106, October 7, 1941 in Yitzhak Arad, Shmuel Krakowski and Shmuel Spector (editors), The Einsatzgruppen Reports: Selections from the Dispatches of the Nazi Death Squads’ Campaign Against the Jews in Occupied Territories of the Soviet Union July 1941-January 1943 (Holocaust Library, 1989), pp. 168, 173. They are also available at http://www.holocaustresearchproject.org/einsatz/situationreport150.html. You may see an image of what the Babi Yar area looks like now at http://commons.wikimedia.org/wiki/File:Babi_Yar_12.jpg.